A new [paper] was published online this week on an archosaur with a fascinating head. The living archosaurs are crocodylians and birds, but the group includes many extinct animals like all the non-avian dinosaurs, pterosaurs, rauisuchians, aetosaurs, and more. All of the animals in this group have teeth in sockets and a couple of new openings in the skull. The archosaurs. From the cover of a different article (Nesbitt 2011). This new archosaur, Triopticus primus, is interesting because it has a dome-head, just like the Pachycephalosaurus and its relatives, the dome-headed dinosaurs. This archosaur is from the Otis Chalk Formation from the Triassic Period. This is where the story gets interesting. 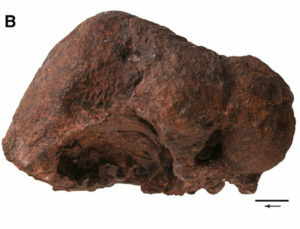 Figure 1b from the paper showing the dome of the new species. The Otis Chalk Formation represents a time when archosaurs were evolving very different body shapes. These body shapes included toothless forms, fast predators, armored herbivores, and long-snouted carnivores. 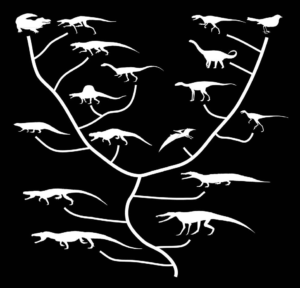 Millions of years later during the Jurassic and Cretaceous, when crocodylian relatives and dinosaurs had taken over, these same body shapes were evolved again. 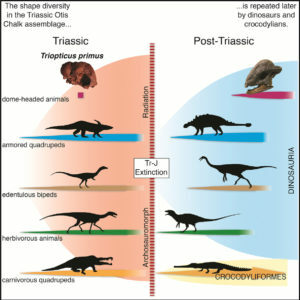 This represents major convergent evolution between early archosaurs and their crocodylian and dinosaurian descendants. You may recall that convergent evolution is when different groups evolve the same features independently. The wings of bats, birds, and pterosaurs are also convergent. These Triassic archosaurs evolved a broad diversity of body shapes and it’s fascinating that many of these shapes were evolved again later on. Cover art from the article showing how different forms evolved the same body shapes.